2 Bedroom, 2 Bath Home On Private Corner Property One Mile East Of Town Site! Tucked in the trees just one mile East of the Historic town site of Julian, California sits An Eagle in the Pines Cabin, your private mountain home, perfectly situated on a corner property that adds to the privacy and comfort of the home! 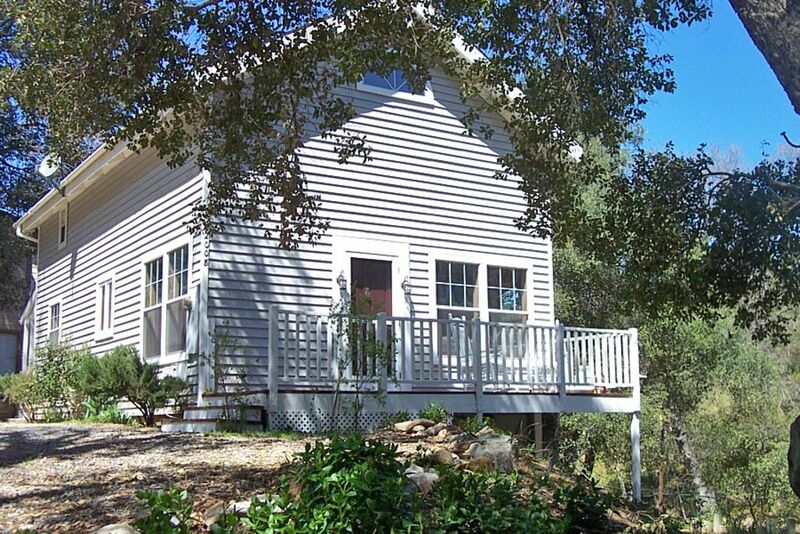 Located at 4200 feet in elevation, this home is a fabulous vacation retreat any time of the year! An Eagle in the Pines Cabin is a warm and comfortable home with high end furnishings and appliances including granite counter tops and stainless steel appliances in the kitchen, a gas fireplace that warms the home throughout, extra comfortable furnishings in the living room, a Flat Screen DirecTV with DVD Player, and CD Stereo with Ipod dock in the open living room. A Loft on the second floor of the home offers a love seat and tv/vcr combination, a perfect place to tuck away with books, movies and to play games. This warm and cozy retreat has all the comforts you could hope for, two bedrooms and two full bathrooms, a Full Modern Kitchen and a wonderful comfortable feel throughout. Jetted tubs and tile bathrooms are an added benefit to the home and your stay! The kitchen is fully stocked with all cooking needs, utensils, and dishware and all appliances including microwave, toaster, and coffee maker with fresh ground coffee are provided in the home for you. Hot chocolate and popcorn are stocked for your enjoyment as well! Both bathrooms are newly remodeled and equipped with jetted tubs. The bathroom on the first floor of the home has a large Jacuzzi tub and shower combination and is surrounded in tile and rock work. The Upstairs Bathroom also has a small corner tub with Shower fixture as well. The back patio is another private and wonderful place to enjoy! Quiet and peaceful, a great place to just be. This home and corner property offers extra privacy and seclusion for that needed escape from the hustle and bustle life tends to offer! An Eagle in the Pines Cabin is a great home for a couple to escape to, and is a perfect getaway for two couples and/or families to enjoy as well. We certainly hope to have you stay at An Eagle in the Pines Cabin in Historic Julian, California in the near future! Two air conditioning units, one on the first floor of the home and one in the Master Bedroom upstairs. A lower circular driveway in front of the home and an upper driveway in directly next to the home. Comfortable Furniture, Large Flat Screen DirecTV, DVD Player, and Idod Stereo, as well as the beautiful Gas Fireplace. Coffee Maker with Fresh Ground Coffee, and a Tea Pot with variety of Teas stocked in the home for you. Large Flat Screen TV in living Room with DVD Player, and TV with VHS Player in the Loft upstairs as well. The home is stocked with Games for all ages! DVDs, Kids VHS, Board Games and plenty of books to choose from! This was our first visit to Julian & we couldn’t have picked a better location. We absolutely LOVED Eagle in the Pines Cabin. It was so charming & cozy & very private. Very close to the historic town of Julian. This was a perfect little getaway & finding this cozy little cabin made it all the more better. Julie the owner was soo wonderful & always so quick to respond to my messages. She made us feel at home. Our only regret was that we didn’t stay longer. We definitely plan on returning & will only ever stay here. Thank you, Julie!! Great property, great area, owners are a pleasure to deal with. This home is warm and serene. Julie is very easy to work with, and is a great host. My family has been staying in this home for the past 3 Christmases and it is a wonderful experience each time! We loved our stay at this cabin. It was perfect for our needs. There was a guide left on the family room table with a list of great hikes. One was walk-able from the cabin and although it didnt say how far the total distance was, I contacted the owner and she promptly texted back the information I asked for. She had texted in the morning to see what time we would arrive and if she needed to have the outside lights on in case we arrived after dark. We are looking forward to staying here again. House was great, locations was amazing. Owners were great. Julian is a Historic Gold Mining Town in the mountains of San Diego County, perfectly situated at 4200 feet in elevation, making all four seasons an absolute treasure and delight! The town site dates back to the 1800s with a deep history of Gold Prospecting and Mining in all the surrounding areas and also a fabulous history and tradition of growing the Best Apples in the region! Rate per night is double occupancy. Six Guests Maximum at $275/night. A $50 Cleaning Fee is charged for the stay. Terms and Conditions are to be agreed upon prior to the charge of the One Night Deposit. An Email Confirmation Note will be sent for the reservation once the deposit is processed.